Turn off the water filtration unit (both the inlet valve and the valve on the storage tank) and open the ledge faucet to relieve pressure. 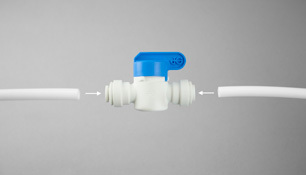 At a convenient place, cut the 1/4" tube going to the unit's ledge faucet and insert the Quick Connect 1/4" tee into the faucet tube. Connect the tube going to the refrigerator into the empty port of the tee. 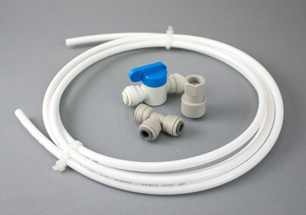 If you have an inline shutoff valve (some kits have it, some don't), cut the tube going to the refrigerator a few inches from the tee and insert the inline valve into the refrigerator tube. The water can flow in either direction through the tee, so there's no “in” or “out”. 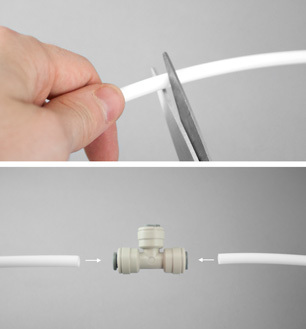 On the refrigerator end, remove the current water inlet tube (if any) from the back of the refrigerator and replace it with the Quick Connect refrigerator connector. Just tighten until it's snug. You probably won't need a wrench. 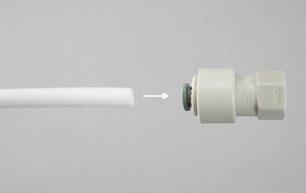 Connect the new refrigerator feed tube by pushing it into the refrigerator connector you have just installed. Turn on the water filter, open the inline valve to send water to the refrigerator, and check for leaks.